Chibok: Aisha Musa Maina digs through an old bag looking for memories of her daughter Hauwa, one of the Chibok schoolgirls kidnapped five years ago by Boko Haram jihadists in northeastern Nigeria. All she has left are old papers damaged by dust and humidity, a school diploma and a small photograph. The kidnap had caused the family such suffering and sadness it feels as if they were all abducted, Hauwa's mother told AFP. On April 14, 2014, gunmen stormed the Chibok girls' boarding school, kidnapping 276 pupils aged 12-17, 57 of whom managed to escape by jumping from the trucks. Their plight moved the world and became a key election issue for President Muhammadu Buhari who was elected a year later on the promise of defeating Boko Haram and returning the girls safe and sound. After negotiations with Boko Haram, 107 of the girls either escaped, were released in exchange for prisoners or were recovered by the army. Hauwa is one of the 112 girls of whom there has been no news. Her family wonders if their daughter is still alive or if she was killed in a Nigerian army bombing, a claim made by the jihadist group. She might have died of hunger or disease, given the army's long-term policy of blocking the group's supplies. She might even have been converted to the group's radical beliefs. 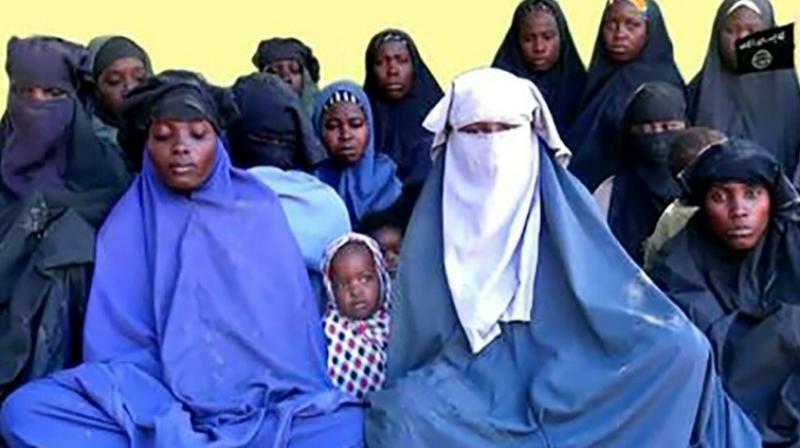 In a propaganda video broadcast by Boko Haram in January 2018, 14 women claiming to be Chibok girls, three of whom held babies, warned their families they would not be coming home. News is scarce in this small, remote town where the literacy rate is very low. Hauwa's father Musa Maina has no idea what has happened to his daughter, although he insists he has not lost hope. "We heard that some parents were reunited with their daughters but ours (is) still yet to come back home," he said. "We aren't losing hope but we are appealing to government to invest more effort to bring back our girls and reunite us," he added. Elsewhere in the country, the passage of time seems to have lowered expectations of finding the girls. At a big traffic junction in the centre of the economic capital Lagos, drivers no longer pay attention to their pictures hung along the railings. Five years ago the "Bring back our girls" slogan - fuelled by social media -- became a powerful rallying cry. Now, the girls' plight takes its place alongside the many other tragedies in this country of 190 million plagued by crime and conflict. Boko Haram has also grown in strength over the past year, after being weakened during the first years of Buhari's presidency -- he was reelected for a second term in February. The Islamic State West Africa Province (ISWAP), the IS-linked faction of Boko Haram, has increased its deadly attacks on military bases, killing several hundred Nigerian army soldiers. Last year on the fourth anniversary of the Chibok kidnapping, the UN Children's agency said more than 1,000 other children had also been kidnapped by jihadists since 2013. In 2016, Human Rights Watch put the number of young boys -- some as young as five -- in the hands of the group at up to 10,000. Some of these children are believed to have been released and sent to deradicalisation centres as the Nigerian army made inroads into Boko Haram territory. Whatever their fate, and that of the Chibok girls, a decade of conflict has taken a heavy toll. The Boko Haram insurgency has claimed 27,000 lives in Nigeria where nearly two million people still cannot return to their homes and also spilled over into neighbouring countries Niger, Chad and Cameroon.